The Tarpon Springs Winter Guard earned first place and were crowned World Champions at the WGI World Championship competition in Dayton, Ohio on April 5. Read about it here. What is Color Guard and Winter Guard? The Color Guard, or “Auxilliary”, combine dance, drama, and performance – with the manipulation of flags, sabers, and rifles – into a magical pageantry. Color Guard is now one of the most popular activities for girls in the high school curriculum. This outstanding performing group is an intricate part of the fall season Marching Band program. In the winter and spring seasons, students perform in a number of dance recitals plus official Winter Guard appearances. 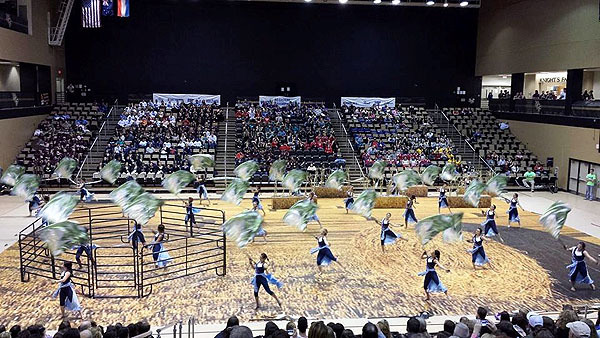 The Winter Guard often travels to venues across the state and region in pageantry theater competitions incorporating a wide range of visual performance arts and choreography. The Winter Guard is a seven-time WGI World Championship finalist. They are the only Pinellas county Winter Guard to be promoted to the WGI World Class division. The Color Guard and Winter Guard, under the direction of Mrs. Jeannine Ford, performs with the Marching Band at all appearances and competitions including Bands of America regional and national events. Visual effects are important elements in competition scoring and high scores require a competent and highly rehearsed Color Guard. A summer Dance Camp program provides opportunities for incoming freshmen and returning students to improve their skills during the summer break. The Color Guard and Winter Guard are integral components of the Leadership Conservatory for the Arts and are supported and funded in part by the Band Booster organization.